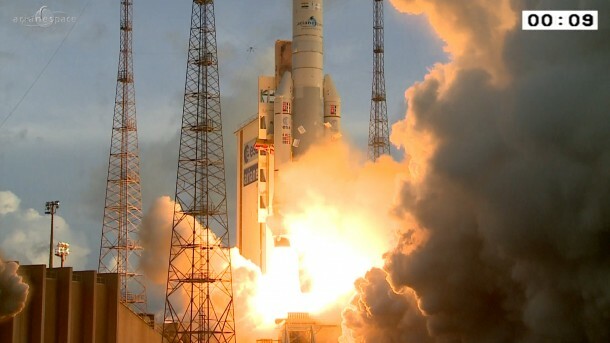 An Ariane 5 has lifted off from Europe’s Spaceport in Kourou, French Guiana and delivered two telecom satellites into their planned orbits. Launch of flight VA221 occurred on 6 December at 20:40 GMT (21:40 CET, 17:40 local time). DirecTV-14, with a mass of about 6300 kg and mounted on top of Ariane’s Sylda dual-payload carrier, was the first to be released about 28 minutes into the mission. Following a series of burns controlled by Ariane’s computer, the Sylda structure encasing the 3181 kg GSAT-16 was then jettisoned. GSAT was released into its own transfer orbit about four and a half minutes after the first satellite. DirecTV-14, owned by DirecTV, will be positioned at 99°W longitude in geostationary orbit to deliver Ultra HD direct-to-home TV across the USA and Puerto Rico. The satellite has a design life of about 15 years. GSAT-16, owned by the Indian Space Research Organization, will be positioned at 55°E in geostationary orbit to augment communication services across India. It has a design life of 12 years. The payload mass for this launch was 10 352 kg. The satellites totalled 9481 kg, with payload adapters and carrying structures making up the rest. Flight VA221 was the 77th Ariane 5 mission.